Here’s what’s up in the world of TV for Sunday, November 6. All times are Eastern. Ash Vs. 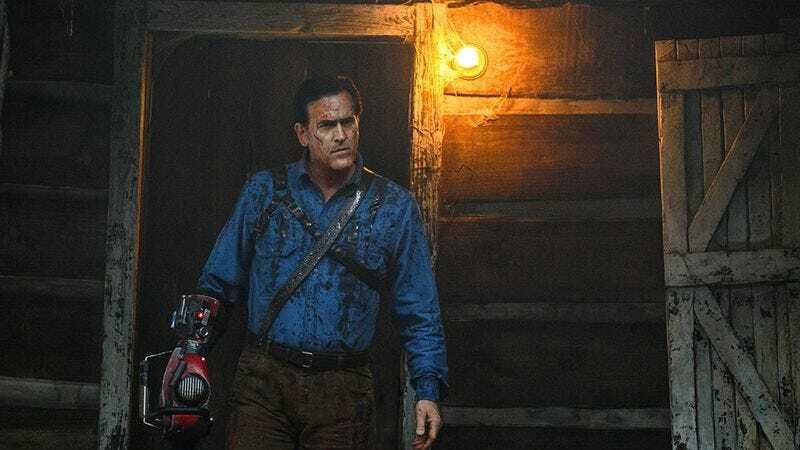 Evil Dead (Starz, 8 p.m.): Halloween may be a spooky, sugary memory at this point, but we’re not ready to let that go just yet, and neither is Ash Vs. Evil Dead. Tonight, an angry mob traps Ash and his cohorts in his dad’s house, and “Ash is finally able to prove to the townsfolk that he is not a murderer but a hero.” Perhaps he’ll don a cloak and breastplate and give a stirring speech, similar to the way he won over the knights and peasants of Army Of Darkness? Michael Roffman doubts it, given that the show’s creative team can’t legally reference the events of Army Of Darkness. We still hold out hope Ash can find a way to convert the Classic into a steam-powered tank once more. Mistletoe Promise (Hallmark, 8 p.m.): It being November, it’s probably too soon for anyone who doesn’t work in retail to be thinking about the holidays. But Hallmark cares not for your sane approach to the calendar, so you know what that means: endless cheesy Christmas movies! Prepare to immerse yourself in saccharine holiday cheer, starting with this film starring Hart Of Dixie’s Jaime King: “A chance meeting between two strangers who share a disdain for Christmas results in The Mistletoe Promise, a pact to help them navigate their holiday complications together. But as they spend more time with each other and experience the magic of Christmas the phony couple discovers there may be more to their contract than business.” There’s a whole true love clause, isn’t there? That’s why your holiday contracts always need to be vetted by an experienced attorney. Love Always, Santa (Hallmark Movie Channel, 9 p.m.): “After losing her husband Bradley three years ago on Christmas Day, Celia Banks never thought she’d fall in love again. Now, her entire world revolves around taking care of her daughter Lilly. Lilly writes a letter to Santa with one wish: for her mommy to be happy and find love again.” It’s possible this results in Santa delivering her one of his elves, mail-order bride-style. If so, kudos to you, Hallmark. Elementary (CBS, 10:30 p.m.): Having heard that Elementary just passed the centennial mark, Myles McNutt is dropping in on his old beat to review episode 101, “To Catch A Predator Predator.” You may catch predator predators, Elementary, but Myles catches obviously empty cups. Don’t try to fool him; it won’t succeed. The Real Housewives Of Atlanta (Bravo, 8 p.m.): For those who are missing Donald Glover’s Atlanta after its first season wrapped up last week, here is another television show set in Atlanta! That is the only similarity that exists between the two. 2016 MTV Europe Music Awards (MTV, 8 p.m.): This year’s ceremony takes place at the Ahoy Rotterdam in the Netherlands. At press time, it is unclear whether Brexit negotiations will also keep the EMAs from being hosted in the United Kingdom in future years. We eagerly await the establishment of the UKMAs next year, which will have the exact same nominees but the trophies will have a greatly reduced exchange rate. Married To Medicine (Bravo, 9 p.m.): And it turns out that this show, returning for its fourth season, is also set in Atlanta! No word if any of the doctors play Paper Boi in their waiting rooms. Holiday Baking Championship (Food Network, 9 p.m.): The third season of the most seasonal cooking show returns, and contestants are busy making “filled Bundt cake wreaths.” For those still coming down off their Halloween sugar highs, these treats make for a pretty good transition between holidays.